Do you see it? Granted, it's not a terribly exciting redesign, but I believe it would be welcomed to those of us who have untold numbers of 1989 Bowman with smashed tops. That's right, I just reduced the height of the card to the "standard" 3.5 inches. I remember when these cards were released. I purchased my first pack at the local pharmacy and was awed at the size of the cards. It was like getting more card for your buck. Like somehow the amount of card surface area dictated the awesomeness to my 13 year old mind. I think that aura lasted approximately one week. 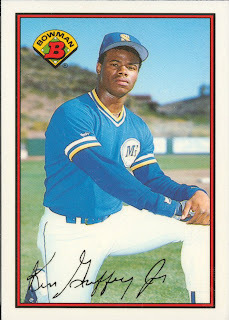 I soon found, like many collectors, that 1989 Bowman didn't fit into ANYTHING available to collectors at the time. Penny sleeves? Nope. 9-pocket pages? Ha! Keep dreaming. Boxes? Not even close. So, we were stuck with cards that couldn't be organized with the rest of our collection. For years, I kept my 1989 Bowman separated from the rest of my collection. It was like Baseball Card Segregation. It was pathetic. As time elapsed, '89 Bowman lost its shine and, let's face it, it hasn't aged well. I can attest to that fact based on the number of smashed 89 Bowmans I see at the LCS. I loved the 1981 redesign, really liked the 1986 design, was 50-50 on the 1987 redesign and totally agree on this tweak. Yes, my '89 Bowman is still quarantined in its specially made box. It's like when they have to build custom-built coffins for unusually large dead people. I once bought penny sleeves that were particularly tall, so the 89 Bowman's ended up there. Topps Big are an even worse problem, those are still in a box unsure of their future.